Zimbabwe spinners backed the impressive performance of their batsmen with a tidy bowling display as they ended their World Cup campaign with a 161-run crushing of Kenya in Kolkata on Sunday. Electing to bat, Zimbabwe were powered to an imposing 308 for six with half centuries from Craig Ervine (66), Vusi Sibanda (61) and Tatenda Taibu (53) as the trio helped their team recover from a sluggish start. Zimbabwe spinners then tormented the Kenyans to skittle them out for 147 in 36 overs in a completely lop-sided battle of minnows at the Eden Gardens. Left-arm spinners Ray Price (2/20) and Graeme Cremer (2/28) and off-spinner Greg Lamb (2/21) shared six wickets between them in their last Group A match. Zimbabwe were already out of contention for a quarter-final berth but they ended their World Cup campaign with a win and four points to finish at fifth in the group ahead of Canada (2) and Kenya (0). The Kenyans were never really in the chase. Instead, they showed urgency in getting themselves out. The Kenyan top-order of Alex Obanda (23), David Obuya (0), Collins Obuya (1), Steve Tikolo (10) and Tanmay Mishra (4) put up a pathetic batting show as half of the side were down by 12 overs with the score reading 44 for five. But the lower-order offered some resistance as Kenya avoided the ignominy of getting out for their lowest score -- 69 -- in the World Cup which was against New Zealand in their first Group A match. 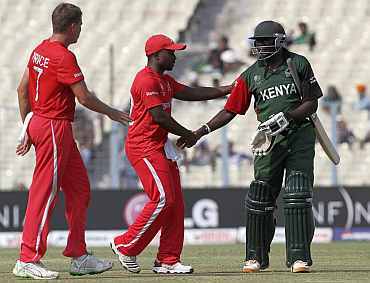 Batting at number eight, Nehemiah Odhiambo top-scored for Kenya with a 47-ball 44, which was studded with five boundaries. Chasing the huge total, Kenya were troubled by Zimbabwe bowlers right from the start and the run-out of Obuya, who scored an unbeaten 98 against Australia, did not help their cause. In his final appearance, Tikolo had a forgettable 14-ball stay at crease before being trapped by Price for 10. 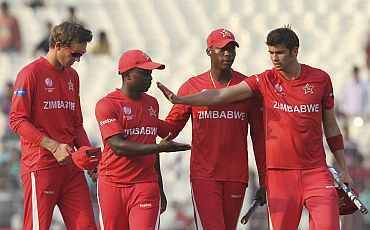 Tikolo, who led the side in absence of injured skipper Jimmy Tamande, asked for a review but umpire Kumar Dharmasena's decision was upheld. When the 39-year-old maverick Kenyan batsman walked off the Eden, all the Zimbabwean players came up to him and shook hands in a fitting gesture while the sparse crowd gave a standing ovation. Earlier, half-centuries from the trio of Ervine, Sibanda and Taibu powered Zimbabwe to an imposing 308 for six. After being reduced to 36/2 in 10 overs, Sibanda (61 from 57 balls) and Taibu (53 from 74 balls) stitched a crucial 110-run partnership from 117 balls for the third wicket to take the Zimbabwe innings forward. Ervine struck a breezy 66 from 54 balls with nine fours and a six while skipper Elton Chigumbura extended fine support with a quick-fire 38 from 41 balls for their second century partnership. The duo stood in a 105-run fifth wicket partnership that came from 86 balls. Prosper Utseya (19 not out from six balls) and Greg Lamb (17 from 10 balls) decimated the Kenyan attack towards the end with 20 runs from the last over to help Zimbabwe post their highest score in the ongoing World Cup. Zimbabwe took the batting power-play in the 42nd over and scored 50 runs losing just one wicket -- Chigumbura while the big-hitting by Utseya and Lamb meant they scored 57 runs from the last five overs. Kenyans struggled with ground fielding and the work behind the stumps was equally sloppy with the team opting to for batsman David Obuya as wicketkeeper in place of Morris Ouma. Obuya had to hand over the gloves to Rakep Patel in the 35th over after injuring himself while trying to collect a wide delivery. 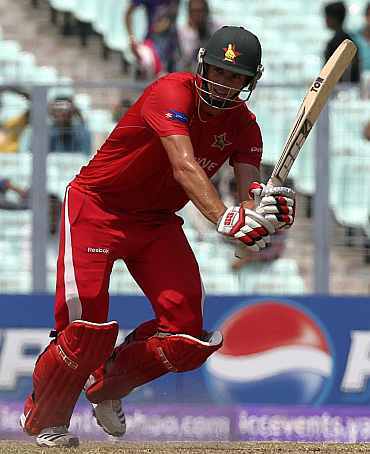 Zimbabwe openers Brendan Taylor (26 from 36 balls) and Regis Chakabva (9 from 22 balls) gave a cautious start to the innings after skipper Chigumbura elected to bat. After the duo was dismissed, Sibanda played an edgy innings but his knock with seven fours and a six put Zimbabwe back on track, while former skipper Taibu gave fine support with a clinical half-century that helped him cross the 3,000-run mark in One-day Internationals. Sibanda stepped out to hit Tikolo for a huge six over long-on to notch his 13th ODI half-century but he soon ran himself out in a mix-up with Taibu. WC: URDS goofs up, yet again!